Read this week’s Angler’s Mail magazine for news on new format and even more prizes in Preston Innovations Matchman of the Year competition. * Barford AA, River Avon, Barford, Warks. Sat, 32. Mike Davies (Barford) 29-15-0, five bream and a carp, feedered worm, peg 72; Ian Patrick (Barford) 27-4-0; Nigel Davies (Shakespeare Superteam) 14-12-0; Tony Avery (Sensas Portway) 14-10-0; Kevin Jones (Bridgnorth AA) 12-1-0. * Bridgnorth AS, River Severn, Linley Bank, Bridgnorth, Salop. Sun, 55. Paul Pountney (Bell Otters) 36-13-0, six barbel, legered meat and pellet feeder in fast water below peg 49; Nigel Ball (DH Tackle) 31-13-0; Dan Shinton (Bridgnorth AS) 30-2-0; Alan Richards (Coseley) 26-10-0; Dave George (Wolverhampton) 26-3-0; Del Waite (London) 24-11-0. * Coors AC Scouts Charity, River Trent, Burton-Upon-Trent, Staffs. Sun, 41. Tony Moreton (Preston Innovations) 9-8-0, roach and dace, waggler and maggot, Ferry Bridge peg 6; Tim Kinson (Burton Mutual) 8-7-0; Dave Webb (Foster’s) 8-2-0; Colin Talbot (Cashmore’s AC) 7-14-0; Harvey Clapham (Doncaster) 7-10-0; Brian Rigby (Shakespeare) 7-4-0. * Daiwa Gordon League, Gloucester Canal, Permali to Pilot, Glos. Sun, 70. Mick Hatchard (Shakespeare Superteam) 36-5-0, bream and skimmers, groundbait feeder, pegged on the high wall; Matt Hall (Maver Midlands) 28-8-0; Nigel Bull (Shakespeare Superteam) 24-7-0; Darren Bickerton (Kamasan Starlets) 19-8-0; Richard Guest (Maver Midlands) 17-10-0; Alan Jones (Daiwa Gordon League) 17-2-0. * Evesham Championship Qualifier, River Avon, Evesham, Warks. Sun, 61. Richie Reynolds (Maver Bait-Tech) 10-14-0, 2 bream to 4 lb on groundbait feeder, then roach on hempseed, peg 43; Tom Scholey (Matrix Dynamite Trentmen) 7-15-0; Matt Woods (Evesham) 6-3-0; Ian Sutherland (Land Rover) 5-13-0; Anthony Taylor (Evesham) 5-6-0. Andy Bruton (Evesham) 5-4-0. Qualifiers: Reynolds, Scholey, Woods. * Help For Heroes, Wassell Grove, Hagley, Worcs. Sun, 48, Match and Brook pools. Terry ‘Heron’ Homer (Club 2000/CPA) 51-8-0, carp to 5 lb plus skimmers, pellet shallow to island, Match peg 9; Dave Johnson Snr. (Club 2000) 37-0-0; Martin Walton (Bartley Green) 35-0-0; Alan Gethen (Club 2000) 32-8-0; Steve Singleton (Quinton) 29-9-0; Craig Stevens (Club 2000) 28-4-0. £300 raised for charity. * Moorlands Farm, Hartlebury, Worcs. Sat, 33, Meadow and Moors pools. Colin Pace (CPA) 165-12-0, F1s to 3 lb, pellet down edge, Moors peg 11; Chris Hill (Mosella) 148-0-0; Sean Slator (Leeds) 113-8-0; Lee Richards (Packington) 71-8-0; Paul Hadlington (Club 2000) 70-14-0. Sun, 36, Silver, Island and Middle. Mal Watson (Daiwa Gordon League) 78-13-0, carp to 4 lb plus F1s to 2 lb, pellet down edge, Island peg 15; Neville Groves (Foster’s) 69-0-0; Colin Pace (CPA) 65-8-0; George Reynolds (CPA) 65-4-0; Sean Slator (Leeds) 63-8-0. * Wychavon Championship Qualifier, River Avon, Evesham, Warks. Sat, 78. Leigh Gardner (Shakespeare Superteam) 20-3-0, skimmers and hybrids, long poled maggot over groundbait, peg 87; Michael Buchwalder (Preston Innovations) 15-10-0; Ian Shepherd (Daiwa Gordon League) 15-8-0; Richard Candy (Sensas Nomads) 11-14-0; Trevor Chalk (Evesham) 8-9-0; Steve Pierpoint (Sensas WB Clarke) 7-8-0. Qualifiers: Candy, Howard Kaye (Sensas WB Clarke), Brian Pollard (Evesham). Angling Trust Cadets, Juniors and Intermediates National, Dynamite Makins, Wolvey, Warks. Sat, Cadets, 30, Phase 2 Crater, Snake and Reptile pools. Lewis Burrows (Tameside Matrix B) 14 Kg 460 gr, carp to 10 lb and silvers, maggot, pellet and corn, Snake peg 17; Bethany Swain (Telford AA) 13.620; Ben Fry (Worksop DAA) 12.560; Adam Tollitt (Tameside Matrix B) 11.320; Sarah Taylor (Tameside Matrix B) 10.880. Teams: Tameside Matrix B 26; Telford AA 20; Worksop DAA 16; Dawley AS 15; Suffolk County 13. Juniors, 102, Phase 1 plus Lagoon and Lizard. Liam Miller (Barnsley Red) 54 Kg 710 gr, carp to 10 lb plus silvers, corn, maggot and pellet, Lizard peg 9; Cameron Cross (Worksop DAA A) 36.510; Dalton Mulinger (Worksop DAA A) 27.200; Harry Munroe (Teamside Matrix B) 25,310; Zak Summerscales (Wakefield AC) 25.290; Jordan Holloway (Browning West Midlands) 24.850. Teams: Sensas A4 76; Worksop DAA A 64 (83.260g); Teamside Matrix B Team Blue 64 (59.690g); Northwich AA 64 (56.850); Barnsley Red 62 (88.520g); Evesham Youth 62 (68. 070). Intermediates, 54, Phase 3. Jake Hemmings (Pride of Derby & Derbys) 28.080, carp to 10 lb plus silvers, maggot, corn and pellet, Thames peg 9; Aidan Mansfield (Casts Bag’em Red) 27.520; Harry Bignall (Barnsley) 23.520; Adam Rumble (Casts Bag’em Red) 21.820; Anthony Furnival (Casts Bag’em Black) 19. 690; Alex Dockerty (Barnsley) 16.800. Teams: Casts Bag’em Red 40 (84.420); Barnsley 40 (75.430); Drennan Bordon 37; Casts Bag’em Black 33; Pride of Derby & Derbys 31 (60.930); Tameside Matrix Gold 31 (52.750). Beechdale AC, Mayer Larford Lakes, Stourport-on-Severn, Worcs. Sun, 14, Arena. Martin Whittaker (Beechdale AC) 69-10-0, carp to 8 lb, corn, down the edge, peg 1; Andy Sargent (Beechdale AC) 69-2-0; Tony Bird (Beechdale AC) 54-7-0. Bilston Angling Centre, Staffs-Worcs Canal, Blaydon Road, Pendeford, Staffs. Sun, 14. Mel Wood (Four Ashes AC) 6-11-7, roach, perch, skimmers and gudgeon, poled squatt, peg 14; Sam Rushton (Mosella Bait-Tech) 5-6-14; Martin Spruce (Bilston Angling Centre) 4-12-0. Bridgtown Social AC, Shropshire Union Canal, Little Onn, Staffs. Sun, 11. Roy Grosvenor (Bridgtown Social) 8-8-6, 2 bream to 4 lb plus bits, poled caster, Cables peg 7; Dave Smith (Bridgtown Social) 6-3-4. Cardiff Nomads, Hendre Lake, Cardiff. Tues pm, 12. Clive Branson (Sensas Nomads) 10-9-0, all roach, waggler and maggots, peg by car park; Andrew Thomas (Risca) 8-2-0. Sat, 15. Clive Roberts (Sensas Nomads) 16-15-0, bream, feedered maggots, peg by rushes; Clive Branson (Sensas Nomads) 15-1-0; Richard Candy (Sensas Nomads) 14-6-0. Dams and Lock, Birmingham-Fazeley Canal, Tyburn, Warks. Sun, 24. Dave McCall (Shakespeare Superteam) 9-15-7, roach, poled bread and squatt, peg 167; Johnny Johnson (Notts AA) 9-11-9; Martin Owen (Browning Lifestyle) 8-3-4; Brent Wilkes (Mosella Bait-Tech) 7-14-8. Elmbridge Fishery, nr. Droitwich, Worcs. Thurs, 13, Heron Pool. Jim Russell (Elmbridge) 71-8-0, carp, corn and pellet, peg 7; Tom Walton (Elmbridge) 57-5-0. Sat, 15, Heron. Bill Hodgetts (Elmbridge) 81-2-0, carp, pellet, top two, peg 39; Steve Lowe (Edward Howells) 74-0-0; Gary Page (Allen’s Tackle, Leamore) 64-0-0. Sun, 10, Peacock. Gary Butler (Kings Heath Angling) 82-6-0, carp, pellet in margins, peg 11; Carl Bennett (Steven’s Tackle) 76-4-0. Evesham Championship Qualifier, River Avon, Evesham, Warks. Wed, 58. James Wilson (Alan’s Tackle) 12-0-0, five chub to 1 lb, an 8 oz hybrid, chublets, roach and bits, chopped worm and maggot at 7m then caster and hemp over groundbait at 16m, peg 40; Clive Branson (Sensas Nomads) 10-5-0; Trevor Chalk (Sensas WB Clarke) 9-12-0; Rob South (Birmingham) 9-7-0; Ray Tamlin (Evesham) 9-6-0; Graham Thompson (Evesham) 9-3-0. Furnace Mill, Bewdley, Worcs. Sun pm, 12. Mucky Meadow. Kev Johnson (Johnson Drywall) 141-4-0, carp, corn over OG F1 and Marukyu EFG161 groundbait down the edge, peg 32; Paul Cook (Maver/Mark’s Tackle) 105-10-0. Goodyear AC, Staffs-Worcs Canal, Slade Heath, Staffs. Thurs pm, 13. Dave Smith (Bridgtown Social AC) 5-8-7, roach and perch, poled maggot, peg 9 railway section; Wilf Kneller (Bilston Angling Centre) 4-12-7. Sun pm, 14, Spring League Final, Greenways Pool, Staffs. Sun pm, 14. Paul ‘Tink’ Martin 72-0-0, 18 carp to 8 lb, pellet feeder, peg 12; Colin Upton 60-0-0; Steve Gallagher 47-0-0. League: Steve Thomson (Goodyear) 144; Bob Davies 139; Pete Rogers 138 (all Goodyear AC). Halesowen RBL, Hawford Bridge Fishery, Hawford, Worcs. Sat, 24, Reddings Pool. Simon West (Halesowen RBL) 127-8-0, carp to 4 lb, pellet, peg 10; Sean Waite (Halesowen RBL) 98-8-0; Steve Robson (Halesowen RBL) 83-8-0; Stewart Mulheron (Halesowen RBL) 74-0-0. Sun, 17. Ken Whitmore (Halesowen RBL) 15-5-0, chub to 2 lb and skimmers, stick float and caster, peg 2; Paul Skidmore (Halesowen RBL) 10-8-0; Steve Horton (Halesowen RBL) 8-14-0. Hawkesbury Hall Farm, Bedworth, Warks. Thurs, 15, Match Pool. John Kidd (Hawkesbury) 151-1-0, carp to 14 lb, dog biscuit, 12m, peg 28; Grant Merrett (Hawkesbury) 99-2-0. Sat, 21, Match Pool. Grant Merrett (Hawkesbury) 74-3-0, carp to 6 lb, meat and corn down the sides, peg 8; Dave Armstrong (Hawkesbury) 70-15-0; John Kidd (Hawkesbury) 69-8-0; Richard E. Grant (Hawkesbury) 68-2-0. Sun, 23, Match Pool. Dave Markham (Hawkesbury Hall Farm) 132-5-0, carp to 8 lb, meat and corn in the margins, peg 6; Dominic Lammi (Ratby AC) 96-9-0; Richard E. Grant (Hawkesbury) 80-6-0; Paul Taylor (Finedon) 69-1-0. Iffers, Mathern Mill, Chepstow, Gwent. Sat, 20. Wayne Meek (Iffers) 140-12-0, carp to double-figures, paste and corn in margins, peg on Waterfall Lake; Ian Sutton (Iffers) 113-13-0; Glyn Sherwood (Wye Angling) 109-6-0; Mark Wellington (Iffers) 97-15-0. Kidderminster DAA, River Severn, Bewdley, Worcs. Wed, 13. Dave Dean (Kent) 39-8-0, 11 barbel to 3 lb, meat and pellet feeder, peg 34; Dan Shinton (Bridgnorth) 27-0-0. Sat, 20. Matt Hamilton (Droitwich) 39-14-0, barbel and chub, hemp and caster feeder, peg 75; Geoff Brierley (Willow Creek) 31-2-0; Pete Williams (Halesowen) 19-8-0. King’s Pools, Shareshill, Wolverhampton, W. Mids. Wed, 20, Big Match Pool. Keith Williams (King’s) 46-14-0, carp and F1s to 2 lb, pellet short, peg 45; Chris Robson (King’s) 45-2-0; John Cockayne (King’s) 45-2-0; Phil Rhodes (PI Boldings) 42-4-0. Sat, 14, Big Match. Paul Gregory (Swan Elite) 77-4-0, F1s to 2 lb, pellet short and shallow, peg 16; Gary Gollins (Swan Elite) 77-4-0; Tim Slater (King’s) 74-12-0. Sun, 6, Inner Match. Gary Gollins (Swan Elite) 45-8-0, F1s to 1 lb, pellet, shallow long, peg 45. Moorlands Farm, Hartlebury, Worcs. Tues, 32, Meadow and Bank pools. Ralph Baxter (CPA) 89-14-0, carp to 10 lb, pellet down edge, Bank peg 2; Steve Wright (Miracle Baits) 78-10-0; Matt Blackmore (Maver) 74-8-0; Rob Cooksey (Maver) 68-12-0; Wilf Lazenby (Leeds) 59-12-0. Wed, 33, over-50s, Silver, Moors and Middle. George Reynolds (CPA) 166-13-0, carp to 10 lb, pellet shallow, Moors peg 1; Paul Hadlington (Club 2000) 149-0-0; Lee Boden (Stone Henge) 108-0-0; Wilf Lazenby (Leeds) 86-8-0; Mal Watson (DGL) 72-0-0. Thurs, 26, Bank, Moors and Island. Ian Wood (Moorlands) 226-12-0, carp to 10 lb, paste down edge, Bank peg 5; Mal Watson (DGL) 114-9-0; Kevin Roderick (CPA) 106-4-0; Bob Shillito (Leeds) 104-1-0. Fri pm, 24, Bank, Moors and Island. Pete Mace (Autism B’ham) 140-8-0, carp to 8 lb, maggot down edge, Bank peg 22; DJ Williams (Halesowen RBL) 117-4-0; Nigel Hargreaves (Leeds) 112-14-0. Mosella Manor Farm Leisure, Harvington, Evesham, Worcs. Wed, 12, Island Pool. Doug Littlewood (Littleton AC) 145-0-0, carp and F1s, pole and pellet, pellet waggler, peg 37; Terry Winstone (Bonehill Mill) 140-0-0. Thurs, 16, Island. Ronnie Biggs (OHMS) 175-0-0, carp and F1s, pole and pellet, pellet waggler, peg 12; Howard Kaye (Sensas) 127-12-0; Fred Parker (Cotswold Angling) 120-0-0. Sat, 16, Middle Pool. Ronnie Biggs (OHMS) 208-8-0, carp and F1s, pole and pellet, straight lead and pellet waggler, peg 6; Neil McKinnon (Preston Innovations) 139-0-0; Martin Wheeler (Woodland Tackle) 133-0-0. Sun, 23, Island Pool. Terry Winstone (Bonehill Mill) 136-6-0, carp and F1s, pole and pellet, straight lead, peg 34; Chris Cameron (Middy/OG) 123-6-0; Ronnie Biggs (OHMS) 109-8-0; Phil Bishop (Arthur’s Angling Supplies) 109-6-0. New City Anglers, Lliswerry Pond, Newport. Sun, 19. Richie Nuthman (Newport) 26-4-0, tench to 6 lb and a 1 lb 8 oz perch, wagglered corn, peg 13 on railway side; Steve Cowhen (Newport) 14-12-0; Johnny Henson (Newport) 12-2-0. Nisa, Dynamite Makins, Wolvey, Warks. Wed, 28, Phase 1 Lake 2. Charlie Shaw (Derby Fishamania) 124-6-0, carp, dobbing pellet, pellet waggler then poled pellet in margins, peg A14; Geoff Ringer (Ringer Baits) 88-10-0; Dave White (Sensas Coalville) 83-12-0; Fred Coxon (Ringer’s Baits) 62-0-0. Thurs, 22, Snake and Crater. Chris Neal (Rutlanders) 138-10-0, bream and carp, paste, Crater peg 14; John Adamson (Nisa) 105-0-0; Andy Searle (Leicester) 88-2-0; Tom Neal (Rutlanders) 78-8-0. One Last Cast, St, James Reservoir, Tredegar, S. Wales. Wed pm, 14. Darren James (Ebbw Vale) 33-0-0, skimmers, cage feeder and corn to lilies, peg on footpath; Richard Blankston (OMC) 29-8-0; Steve Frogg (OMC) 20-3-0. Sun, 18, Tirley Court, Gloucs. Steve Frogg (OMC) 200-0-0, all carp, poled maggots in margins, peg on shallow side; Miles Clarke (OMC) 198-0-0; Dan Ewers (OMC) 186-0-0. Packington Somers, Meriden, Warks. Wed, 16, Molands Mere. Danny Tresigne (Packington Alvechurch) 92-2-0, carp to 1 lb, F1s to 2 lb, pellet well out, peg 8; Max Higgott (Team Makins) 78-14-0; John Burchell (Packington) 74-2-0. Sat, 28, Big Geary’s. Tony Musticone (Packington) 35-11-0, carp and skimmers, pellet, peg 17; Fred Coxon (Ringer’s Baits) 35-7-0; Derek Hartshorn (Swann Baits) 24-12-0; Ron Savage (Lane’s Bait) 19-3-0. Sun, 19, Molands Mere. Andy Wooding (Solihull Angling Centre) 58-11-0, carp, tip and pellet, peg 21; Derek Hartshorn (Swann Baits) 40-11-0; Ray Quinney (Packington) 31-11-0. Preston Innovations Boldings, Bridgnorth, Salop. Mon, 14, Acorn and Willows pools. Dave Matson (Rod and Gun) 111-10-0, carp to 7 lb, pellet at 5m, Acorn peg 5; Phil Shaw (PI Boldings) 107-1-0. Wed, 15, Oak. Dave Matson (Rod and Gun) 121-3-0, carp to 7 lb, pellet at 5m and sides, peg 31; Mark Mountford (Shifnal) 113-7-0; Phil Shaw (PI Boldings) 87-7-0. Thurs, 24, Sycamore and Larch. Gareth Emlyn (OAC) 90-11-0, carp to 7 lb and barbel to 3 lb, maggot down sides, Sycamore 4; Dave Craggs (Maver Midlands) 88-1-0; Morgan Davidson (OAC) 79-1-0; John Cockayne (Lichfield) 72-7-0. Sat, 17, Sycamore. Andy Kyte (Maver Sonubaits) 79-8-0, carp to 6 lb and barbel, pellet to 5m and maggot down side; Colin Reynolds (Bilston Angling Centre) 72-6-0; Mark Taylor (Shakespeare) 67-9-0. Sun, 28, Larch Pool. Dave Hailey (PI Boldings) 163-5-0, carp to 4 lb, pellet shallow, peg 1; Andy Kyte (Maver Sonubaits) 120-14-0; Steve Roberts (OAC) 119-7-0; Mark Taylor (Shakespeare Vespe) 97-6-0. Preston Innovations Woodland View, Hadley, Worcs. Tues, 15, Ghost Pool. Mark Westwood (Bilston Angling Centre) 149-8-0, carp, pellet short, peg 18; Wayne Panting (Woodlands) 117-0-0. Fri, 21, Ghost. Rich Edmunds (Woodlands) 138-14-0, carp, pellet down edge, peg 2; Alan Tait (Peg One Angling) 128-12-0; G. Collett (Starlets Vets) 128-8-0. Sat, 22, High. Phil Edmunds (Peg One Angling) 191-0-0, carp, dead maggot down edge, peg 25; Mike Edge (Woodlands) 174-10-0; Alan Tait (Woodlands) 128-4-0; Rich Edmunds (Peg One Angling) 127-14-0. Sun pm, 24, Hay and Barley. Danny Baker (Tredegar Angling) 123-8-0, carp, pellet, Barley peg 5; Mark Jones (Tredegar Angling) 112-0-0; Rob Brennan (Kamasan Starlets) 105-0-0; Mark Westwood (Bilston Angling Centre) 94-14-0. Reedswood AC, Reedswood Pool, Walsall, W. Mids. Tues, 13. Gaz Willey (King’s) 36-0-0, carp to 4 lb, corn at 14.5m, peg 23; Brian Rigby (Shakespeare) 24-4-0; Richard Broomhall (Beechdale AC) 19-8-0. Rhymney, Fochriw Feeder Pond, S. Wales. Sun, 14. Malcolm Heaven (Cefn Hengoed) 8-4-0, one small carp with roach and perch, feedered maggots, peg opposite island; John Hancock (Rhymney) 6-4-0; Terry Moss (Rhymney) 5-7-0. Sirhowy, Mathern Mill, Chepstow, Gwent. Pete Edwards (Neath) 185-12-0, carp to double-figures, poled corn in margins, peg on Waterfall Lake; Matt Jackson (Newport) 143-0-0; Rob Dyer (Swansea) 139-8-0. Tunnel Barm Farm, Shrewley, Warks. Mon, 17, Club Pool. Dave Oakley (Cudmore) 190-3-0, F1s to 2 lb 8 oz, roach and skimmers, maggot shallow at 6m and edges, peg 23; Adrian Perrins (Cudmore) 178-10-0; Alex Harper (TBF Colts) 177-6-0. Tues, 23, over-50s, New Pool. Pete Hancox (B’ham) 131-11-0, F1s to 3 lb, roach and skimmers, pellet and paste, top two, peg 19; Dave Kingerley (TBF Vets) 128-2-0; Ken Turner (TBF Vets) 118-15-0; Dave Pope (TBF Vets) 94-7-0. Wed, 16, Canal. Pete Rice (Bag’em) 176-14-0, F1s, roach, barbel and silvers, maggot through slop, top two plus one, peg 11; Pete Hancox (B’ham) 127-1-0; Tony Walsh (Mosella UK) 126-13-0. Thurs, 67, TBF Vets, New, Extension and House. Tony McGuire 174-3-0, F1s, pellet shallow at 6m, Extension peg 7; Steve Johnson 140-11-0; John Berry 137-3-0; Chris Constable 131-10-0; Alan Higgs 96-15-0; Chris Jordan 80-11-0 (all TBF Vets). Fri, 16, Club. Pete Rice (Bag’em) 205-9-0, roach, skimmers and F1s, maggot through slop, top two plus one, peg 14; Mark Rice (Bag’em) 195-5-0. Sat, 19, Jenny’s. Mark Rice (Bag’em) 175-1-0, F1s, barbel plus mixed silvers, maggot through groundbait slop at 3m, peg 8; Dave Elliott (Packington) 152-12-0; Richard Knowles (Shakespeare) 141-8-0. Sun, 22, Canal Pool. Ade Mansfield (Shakespeare) 149-7-0, F1s, barbel, roach and skimmers, banded pellet shallow through caster at 13m, peg 2; Gary Cook (Mosella UK) 118-15-0; Lee Richards (Packington) 106-3-0; Pete Rice (Bag’em) 105-13-0. Wassell Grove, Hagley, Worcs. Sat, 14, Match Pool. Ian Ross (Wassell Grove) 77-8-0, carp to 6 lb, pellet at 14.5m to island, peg 12; Dave Johnson Snr. (Club 2000) 46-0-0; Alan Gethen (Club 2000) 46-0-0. White Springs, Pontarddulais, nr Swansea. Wed, 14, Pit Lake. Chris Bradley (Burry Port) 48-8-0, carp, poled pellets in margins, peg 7; Marj Thomas (Swansea) 46-8-0; Alan Godrich (Swansea) 44-0-0. Sun, 19, Old Canal. Brian Bevan (Swansea) 62-12-0, carp and bream, poled pellets, peg 14; Alan Godrich (Swansea) 45-8-0; Jim Hart (Neath) 42-8-0. Wolverhampton AA, Staffs-Worcs Canal, Penkridge, Staffs. Wed pm, 9. Dave Smith (Bridgtown Social AC) 15-3-0, 5 bream, poled chopped worm and caster, down the track, peg 1; Richard Guest (Maver Midlands) 6-14-8. Wolverhampton over-60s, Staffs-Worcs Canal, Rodbaston, Staffs. Wed, 22. Roy Grosvenor (Bridgtown Social) 4-0-0, a 2 lb chub plus roach, poled worm and caster, peg 21; Tony Keeling (Team Eclipse) 3-11-3; Dave Pinches (Goldthorn Social) 3-2-4. 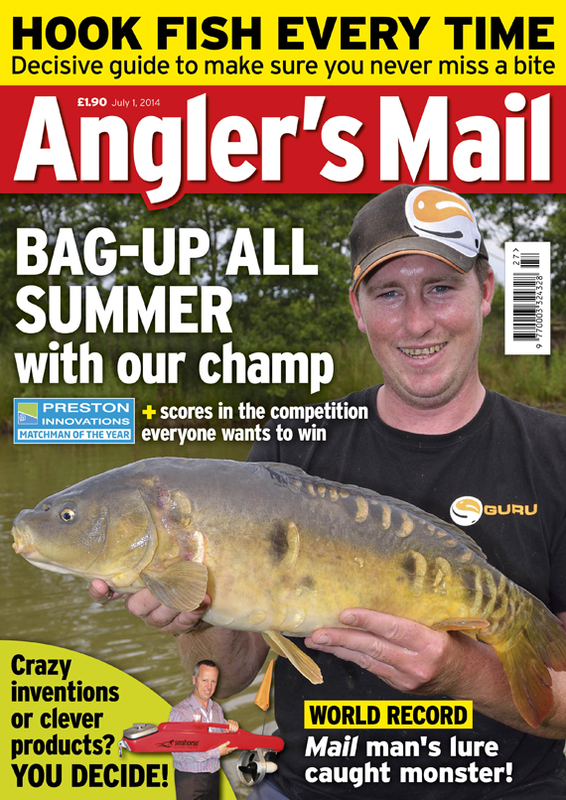 This week’s brilliant issue of Angler’s Mail includes a fantastic feature with our Matchman of the Year, Andy Bennett. Learn from the champ, and bag-up all year!